In the Pink--Back to School with Child #4! I've joined Beverly at How Sweet the Sound for Pink Saturday. Pink is Child #4's favorite color. And fellow writer and 2k8 classmate, N.A. Nelson, is participating in Seattle's Three Day Breast Cancer Walk. This is at the beginning of Oct. So, pink is on my mind. Please click here to see a list of the other Pink Saturday participants. Hello, it's nice to meet an author. Your book cover even has pink on it! Welcome to your first Pink Saturday, Barrie. I'm so glad you decided to participate. What cute pink things #4 has, and there are so many adorable things in the marketplace. I think it is so wonderful that pink is the color of hope. And, we all have hope for a cure for all cancers. I love the back-to-school backpack! So cute with the cupcake! Happy Pink Saturday! Hi, thank you for coming by~ unfortunately my "PINK" was posted yet. That was completely due to to operator error. :) Congratulations on your book, what an amzing adventure. Oh, boy, school is starting!! How funny that this thing that used to regulate my life is no longer on my mind! My son is now in his third year at college. Hope your daughter has fun at school. She's got a great Pink backpack! Just great pink post - Happy Pink Saturday! The pink shirt she's wearing on the cover is so great! This is a cool PINK backpack! Have a Happy and Bless First Pink Saturday. Barrie, welcome to pink Saturday. Your daughter's start off to school must have been fun. 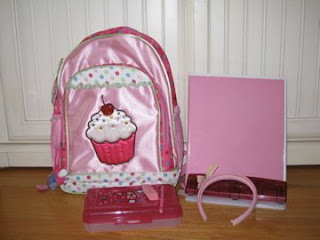 Her love of pink gave her some adorable pink little girl school items to share. Did you take a picture? Sweet back to school pink! What a fun way to go back to school! What a great study in pink! Love it! I love the pink backpack. SO cute! This looks like the first day of school for my oldest child! She's always loved pink. Kaje' loved purple until about two years ago and then wanted this hot pink room. I was so afraid she'd tire of pink but not yet! LOL! That's a great backpack. It's so much fun with a girl-girl! Very cute, I love all the little girl items they have these days. Very sweet girly girl pinkness. Thanks for popping in to see me! Wonderful Pink Book Bag. I hope you have a wonderful new week. Delightful pink school bag! Lovely pic! Hi Barrie, Oh what a cute girly girl pink that is, I love it. Cheers Debra. Oh and I am feeling much better thankyou for your lovely comments and best wishes. With all that *pink*, it's got to be a good school year! I'll bet she went off to school a very happy little girl! Congrats on your book deal! How wonderful! That's a dream come true for me, too! I like to write children's stories. awww! those items are so pinky-cuuuute! thanks for the visit and for the prayers.